Grid It is a hot organiser gadget which helps you to store you’re gear securely and to carry it around without the need for a backpack. Let’s dive in and investigate further with a comprehensive BurnTech.TV Grid It Review. 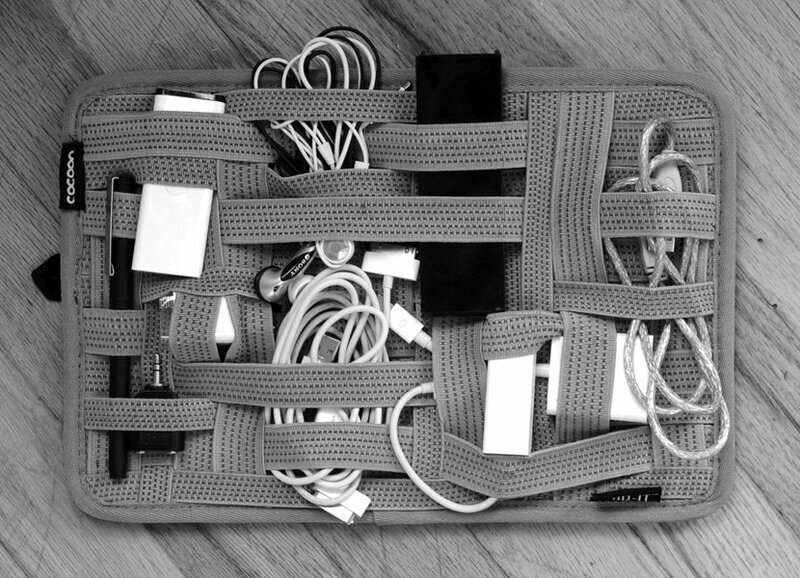 Grid It is made by Cocoon, and they bill it as the “ultimate organiser”. It’s a stiff flat mesh of elasticated bands, which are interwoven amongst each other in order to allow objects to be tightly inserted amongst the bands. So if you carry a bunch of accessories like headphones, chargers, iPods and smartphones, then Grid It could be a very nifty solution for you. Grid-It is easy to use and makes finding my gear quicker and easier. There’s a nice combination of speed of access to your tech gadgets and the peace of mind that comes with knowing that they’re securely stowed. 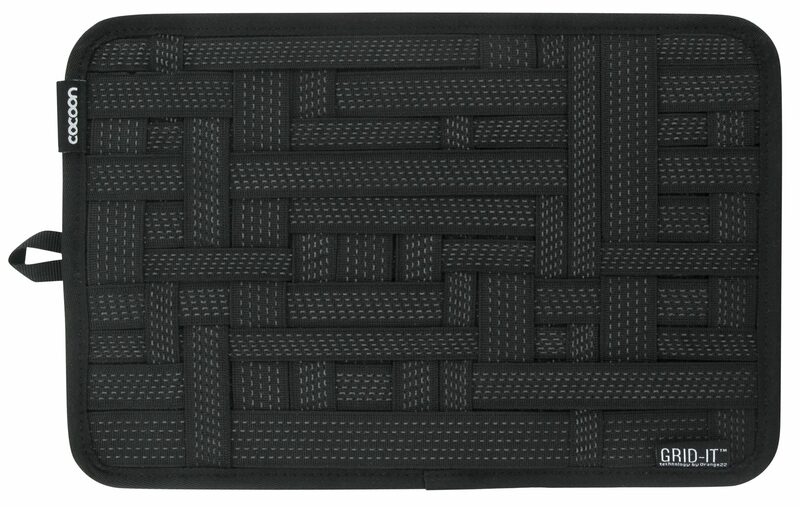 The genius of the interwoven elastic design is that Grid-It works equally well for both larger and smaller items. The longer bands allow for an iPhone to fit easily, whilst the smaller bands work like a charm for small pieces of stationary, like pens and pencils. I see a lot of potential in Grid It for when I am travelling around, and a ruck sack can be an irritating way to store a lot of smaller accessories. Headphone cables can often end up intermingling with charger cables, which in turn wrap around everything else in my back pack. If instead I utilise the ‘ultimate organiser’ in order to store these everyday accessories, then it becomes much quicker and easier to locate the goods. Storing devices like your smart phone, iPod or even your compact digital camera is another good use for the Grid It. Items feel snug and secure when they’re popped into the elastic bands, and the stiff backing to the Grid IT offers an additional layer of protection. I put my higher value tech gadgets into the Grid It and then into my backpack, ensuring the thick base of the organiser is angled for best protection. A slightly unusual use of the Grid It also comes in my gym bag. My gym bag is a tangled mess of fitness technology, including locker padlocks, gym notebooks, pens, a stop watch and a heart rate monitor. These are all items that I want to immediately locate as I go to drop off my gym bag and to start my workout. Grid It actually works really well here, even though I’m pretty sure that Cocoon didn’t have that down as a use for this device. Having used Grid IT for a few weeks, mastering the art of maximising the organisation of gear within it to full effect, I have been surprised by just how much gear you can stow in it. In reality, the Grid-It would store many more items then I would ever need it too. The design relies heavily on the tension of the elastic, and my experience with elastic has always been that it stretches over time and loses tension. It happens with elastic waistbands on running shorts and I fear it could happen here too. Looser, less secure elastic could lead to broken tech gadgets. The more you push it in terms of loading the Grid-IT up, the more you fear this would become a problem. I’m also not quite sure where I sit with the price of the Grid-IT. It retails at around £15, which I think is at the high end of what I would be willing to pay for something that only enhances my current storage. It’s not fixing a problem per se, but it is helping me to organise my gear. I don’t strictly need a Grid IT, so it becomes a nice to have without being a big enough nice to have to make me go storming out to buy one immediately. I was given mine at a conference in a goody bag. So all in all, the Grid It is a good organiser which definitely helps you to organise your day to day accessories.